In the digital age, business demands that marketing drive digital commerce. 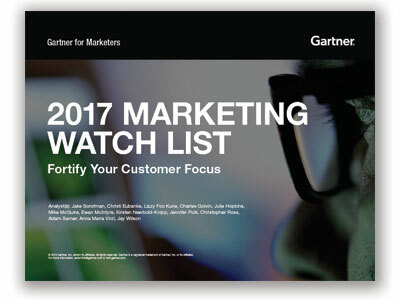 The 2017 Marketing Watch List shows you tools and capabilities you can use to grow revenue, improve customer experience and strengthen your marketing technology infrastructure. Discover recommendations to optimize your marketing with the right technology, staff and guidance to get things done.